This is an original 1970 UK 1st pressing Box set Cat No PXS 1 Complete with all correct original Components ( no added replacements !!!! ) Very nice set including a stunning Near Mint Vinyl and Top Book with no loose pages ! Complete with the correct issued plain white inner , again in very clean condition with just some light creasing from storage . 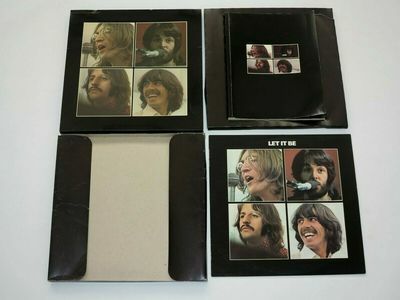 VERY NICE EXAMPLE OF THIS SUPER BEATLES ORIGINAL SBOX SET / COMPLETE UK 1st PRESSING ! ITEMS ARE GRADED USING THE UK RECORD COLLECTOR GRADING SYSTEM. ALL ITEMS ARE PLAY GRADED AT VOLUME AND ARE VISUALY INSPECTED BOTH IN DAYLIGHT AND UNDER STRONG LIGHTING WITH DETAILED DESCRIPTION. DISCS ARE ALWAYS REMOVED FROM THEIR COVERS AND HOUSED IN PROTECTIVE PLASTIC SLEEVES.THEY ARE THEN PLACED BETWEEN RIGID CARD STIFFERNERS FOR FULL PROTECTION. PLEASE NOTE ! IF YOU ARE IN THE UK POSTAGE WILL BE £16.00 AS THESE ITEMS ARE IN SWEDEN ! EBAY DEFAULT IN LISTING ! POSTAGE COSTS WITHIN SWEDEN WILL BE £9.50, THE REST OF EUROPE £16.00, FOR USA/CANADA /JAPAN £18.00 FOR ANYWHERE ELSE PLEASE CONTACT FOR MORE INFORMATION ! PLEASE NOTE ALL ITEMS WILL BE SENT WITH SIGNED FOR / TRACKED MAIL ! BUYERS WILL NOT PAY ANYMORE THAN THE ACTUAL COST OF POSTING AND COMBINED PURCHASES WILL BE CALCULATED ACCORDINGLY ( DEPENDING ON WEIGHT AND DESTINATION ) . PLEASE DO NOT HESITATE TO CONTACT WITH ANY QUESTIONS. THANKS AND GOOD LUCK !